Review: Do you like fiction and history? This book is a historical fiction and fantasy book, but has a lot of action and adventure. 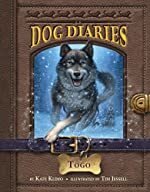 In the Dog Diaries: Togo by Kate Klimo, it follows a husky sled dog from Nome, Alaska's journey to the lower 48 States of America in a competition to become the most well none dog in the land. This book is a part of a series called Dog Diaries with other installments named Ginger, Buddy, and Barry. Dog Diaries: Togo, begins with a group of sled dogs in Nome, Alaska that transport their owner from place to place and race in local dog races. The owner's favorite is Balto, another sled dog. He is the fastest sled dog in Nome, and all the other dogs are jealous. One dog-named Togo is very jealous and determined to become more popular. Balto is old now so Togo tries to run faster than the other dogs to beat Balto's record. Togo runs so fast that his trainer brings him and all the other dogs down to the lower 48 states of America to show off their talent. Starting off in the Northwest, Togo sees a challenge because the running place is a roller rink with wood not snow. Togo accepts the challenge and runs. The crowd is surprised at how fast he can run. He ran in rinks in Oregon, California, Arizona, Nevada, and other North and Southwestern states. Then Togo's owner got a call and Tago has to race Balto back in Nome, Alaska. Who will win the race? Can he beat Balto? Only the book knows. Overall Dog Diaries: Togo is good. It has a solid storyline and plot and the characters are developed well. The book pulled me into the story line as if I was in the audience at the races. I think that if you read Togo you will want to read the other books in the series. Togo has a lot of courage to go up against Balto in the race and is an inspiration to me for over coming challenges. The trainer inspires you to have someone by your side after every move you make. But most of all, the crowds of people at the races spoke to me in a way neither Togo nor the trainer did, they always push you to keep going during challenges. The book has an adventurous plot that I really enjoyed. I recommend this book for middle school readers. This is the best book I have read so far this year.